Home > Family Letters > In a Digital Age, Why Write a Thank You Letter? In a world full of text messages, emails and tweets, where fax machines are ancient technology and actually speaking is the last thing any of us do on the 3rd Generation Smart Phone that we all seem to carry with us everywhere, you might be tempted to conclude that the letter has finally gone right out of fashion. 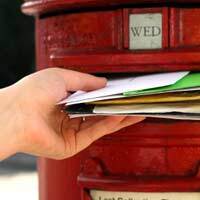 Even though the Royal Mail reportedly now carries as many letters every weekday as they used to deliver in the Christmas busy season a decade or two ago, it seems most of the load is business related; very few of them are sent to and from private individuals. Yet, despite the burgeoning of social media sites online, the ‘thank you letter’ has doggedly hung on, resisting the gradual slide into extinction that threatens so many other forms of sociable correspondence. It may not be as common as it once was, but it is undoubtedly bucking the wider downward trend – so the question is, in our digital age, just why does anyone still write a thank you letter? On the face of it, it’s a very good question, if only because it’s nowhere near as convenient or quick as firing off an email – but then that’s the whole point! My long-dead grandmother came from a time when letter writing was definitely the norm, not least because it was the only effective means of long distance communication open to ordinary people – well, other than something wildly impractical like smoke signals or semaphore. Her constant advice to her very young (and often rather lazy) grandson – “if someone takes the time to give you something, then the least you can do is take the time to write to say thank you” – and she was right. Whether it’s, as then, a childish scribbling of thanks for a two-penny toy (and we are talking pre-decimal here!) or a grown-up letter over something far more important, taking the time to write shows you mean it. Writing a letter isn’t something you can dash off easily, and that’s a big part of why getting a written ‘thank you’ makes such an impression on the recipient. To shamelessly echo the sentiments of John F. Kennedy, we don’t chose to do these things because they are easy, but precisely because they’re hard. It takes a bit of effort to write a letter – OK, admittedly not as much as it took NASA to put the first man on the moon way back in the 60s, but you get the point, I’m sure. Digital communication in all its forms has become ubiquitous; it’s everywhere and all pervasive, which inevitably means much of its impact is lost. In the early days of the internet, getting an email was something pretty special; actually, even knowing somebody who had an email address was fairly rare. Today, spam flies into our inboxes with tedious regularity each day, a quick glance at the subject line of the rest consigns nine-tenths of it to ‘junk’ and few of us read what has survived this brutal triage particularly thoroughly. The late 1980’s ‘wow’ factor of much of all this instant communication has gone, replaced with familiarity, and as the proverb warns, that can breed contempt. The physicality of a thank you letter is another strong reason for the enduring appeal of pen, paper and note-card. It is the alpha-numeric equivalent of the snapshot photo in your pocket. Digital photography is an incredibly convenient medium, and the power of image manipulation software has to be seen to be believed, but when you are far from home you don’t want to have to switch on some device, or plough through picture library folders for a quick reminder of your loved ones. When Blondie’s Debbie Harry sang about having a photo in her wallet to remind her of “something more solid” everyone knew what she meant – and the written words of a thank you letter are exactly that. Compared to the ephemeral nature of emails and texts, which can be deleted in moment’s inattention or lost in a device failure, a real letter, written on real paper, made from real trees, is immeasurably more solid. Perhaps more importantly, it is so much more tangible a reflection of the thanks being conveyed. So in a digital age, why write a thank you letter? Simples! Because it works, and it probably always will, no matter what method of communication we come up with next.